The U.S. economic recovery remains intact and may finally be exhibiting signs that growth is picking up as job gains across the country are now on pace to be the strongest since 2000. 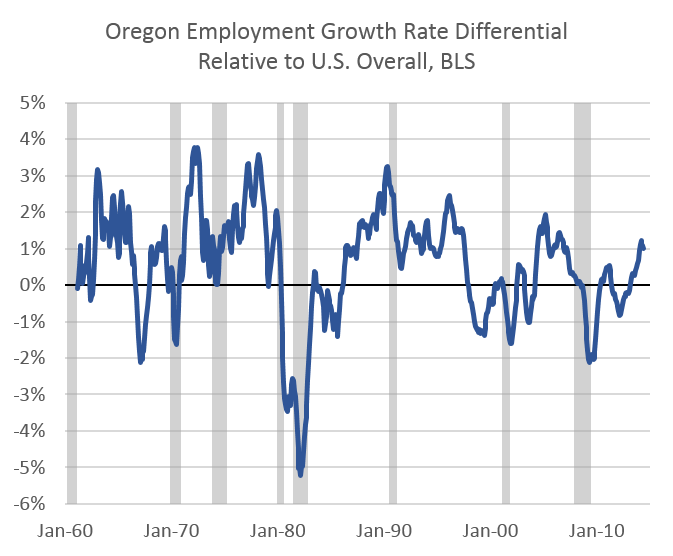 Oregon’s employment growth has accelerated sharply over the past year and a half. The state is now adding jobs about one percentage point faster than the nation, a differential growth advantage Oregon typically enjoys during economic expansions. Along with more job opportunities come more individuals in search of employment. In the past nine months, Oregon’s labor force has increased and added back nearly a quarter of the labor force losses it suffered following the financial crisis. As the labor force increases, it places upward pressure on the unemployment rate, but for a good reason. Even with the stronger job gains, the state’s unemployment rate has remained unchanged in 2014. As the economy continues to improve, an increasing amount of attention is being paid to the Federal Reserve and future path of monetary policy. If economic slack remains, further accommodative monetary policy makes sense, since temporary support has the potential to prevent permanent damage to our productive capacity. Alternatively, if the economy is once again firing on all cylinders, monetary policymakers should turn their attention to fighting inflation rather than supporting growth. A stronger recovery, should it come to fruition, draws the economy closer to full employment and the Fed and monetary policy will take center stage. Even with a fundamentally stronger Oregon economy, fiscal year 2014 came to a close with state government revenues having posted only middling gains over the year. The April 2014 tax filing season was not a good one for states like Oregon that depend heavily upon personal income tax revenues. Year-end personal income tax payments tied to investment income fell sharply in response to higher federal tax rates put in place during 2013. Many Oregonians cashed out capital gains and other investments in 2012 in anticipation of upcoming federal tax rate increases, leaving fewer gains to be realized for tax purposes this year. Overall, the outlook for General Fund revenues in Oregon remains on track for now, with collections in Fiscal Year 2014 closely matching the Close of Session forecast that was used by the legislature when crafting the 2013-15 budget. Although revenues have mirrored the Close of Session forecast to date, the outlook for revenue growth during the second half of the biennium has become stronger in recent months. 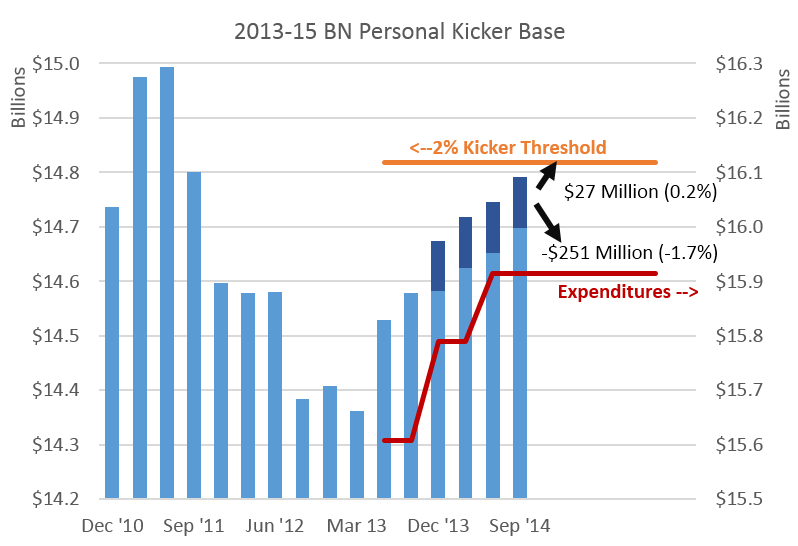 A more optimistic economic outlook for Fiscal Year 2015 combined with revenue increases enacted during the 2013 Special Session suggest that revenue growth will accelerate this year, raising tax collections near to the personal income tax kicker threshold. Despite increased optimism, the 2013-15 biennium is far from over, and therefore significant uncertainty remains. One more income tax filing season remains between now and the end of the biennium. As such, many risks to the outlook remain. On the upside, if equity markets continue to boom or if wage growth accelerates sharply, a short-term spike in revenues remains possible during the coming months. The primary downside risk facing the near-term revenue forecast is the uncertain future of the nationwide economic expansion. Should contractionary monetary policy or economic weakness among our trading partners derail the U.S. economy, the strong expected growth in Oregon’s tax collections will not be realized. Revenue growth in Oregon and other states will face considerable downward pressure over the 10-year extended forecast horizon. As the baby boom population cohort works less and spends less, traditional state tax instruments such as personal income taxes and general sales taxes will become less effective, and revenue growth will fail to match the pace seen in the past.